The Delaware River engulfs a bridge joining Easton, Pa., and Phillipsburg, N.J., inundating an intersection during flooding on June 28. 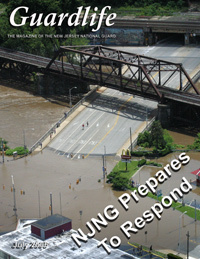 The New Jersey National Guard provided support to the Ewing Police and the Governor's Office during the State Emergency. Photo by Sgt. 1st Class Robert Stephenson, NJDMAVA/PA. 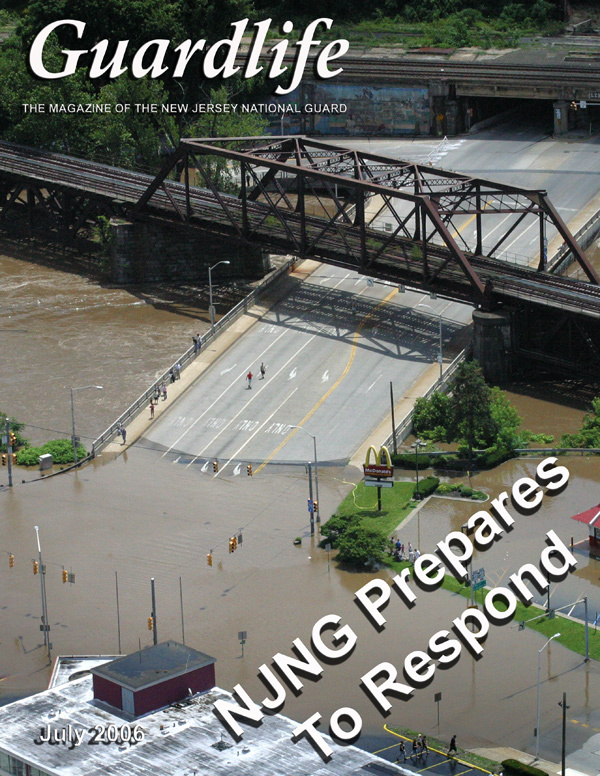 GUARDLIFE is published bi-monthly using federal funds under provisions of AR 360-1 and AFI 35-101 by the Public Affairs Office of the New Jersey Department of Military and Veterans Affairs for all members of the New Jersey Army and Air National Guard. The views and opinions expressed herein are not necessarily those of the Department of Defense, the Army, the Air Force or the National Guard Bureau. Specialists' Richard Schwarz Jr. (left) and Justin Francis (far right) of the 63rd Army Band perform Taps at the Brig. Gen. Doyle Veterans Memorial Cemetery Memorial Day Ceremony. Photo by Tech. Sgt. Mark Olsen, NJDMAVA/PA.